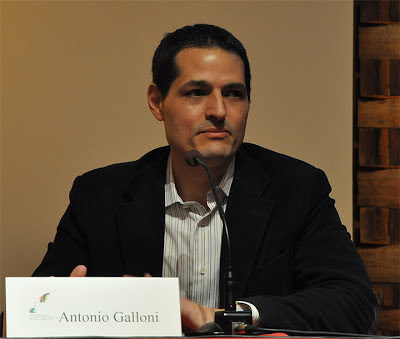 This week, when Antonio Galloni announced the launch of his independent site, www.antoniogalloni.com, it was a surprise. Many folks thought he was the heir apparent to Robert Parker. Well, he might just be. But now he's the driver, not a passenger. I have long admired Antonio’s calm presence. He doesn’t get washed over by waves of attention or scrutiny. He plies his trade, goes about his business, does the work. And while it may appear to be a glamorous career, anyone who travels extensively knows there is more to it than dining and drinking. I wish him well. He did it with class. He didn’t come out with a TMZ video declaring all that he touches gets 95 points. He is the introvert’s critic. A thinking man, not just hedonistically driven by fame and fortune. It is likely he will make a good living. Luxury tastings, like the ones he gives, can generate considerable income. Probably the best news, about those he does in New York, will allow him to sleep in his own bed, wake up with his family in the morning. If you’re on the road as much as he has been, things like one’s own pillow mean a lot. More than the fame. But beyond the famous tastings and access to the best and the brightest wine makers, Antonio brings his own sensibility. He is "consistent to himself." He has a master’s palate and he is able to share his thoughts in words that are intelligent and deliberate. When he talks, people lean in, not wanting to miss anything he might be saying. In addition, he has seen that writing alone cannot reach the scores of young people who are becoming more interested in wine. While he doesn’t feel the need to walk the media plank ala Gary Vaynerchuk, Galloni has seen the impact an interview with a winemaker makes to those who take their cues from a visual world. The other matter about Galloni is his interest in the dialogue. Folks like Parker, Suckling, and to a lesser degree, Robinson, are more driven by delivering information from their portals. I sense Galloni has his ears a little closer to the ground, listening to the drumbeat outside his immediate world. I like that about him. It makes him appear to be more sympathetic to those who pay attention to what he says and does. Fluency in English, Spanish, Italian and French gives him the world. He can communicate with people in France, Italy, Spain, South America and elsewhere, in their language. That is an immense advantage. His musical inclination gives him another dimension of understanding. He is young, intelligent and calm. He has a great path ahead of him. What does this mean for Italy? For English language readers, Galloni will be a main source for information about where Italian wine is heading. He has the ability to transform the way Italians make wine in that his influence is huge. The next generation will be very interesting to witness this evolution in Italy. Will the Wine Advocate survive? Did the Wine Spectator endure when James Suckling exited? These publications have their own life. They’ll be fine. Antonio Galloni will be fine too, he’s gotten his life back under his control. He’s in the driver’s seat. It’s going to be an interesting journey. Galloni is in a rally good position to have a big impact on wine. He seems to "get" Italian wine and is as fine a writer on the topic as we have working today. The jury is still out on the other regions he covers. I think his last California reviews were a huge misstep. He needs to take great care that he doesn't become involved with so many high-end wine events that he is viewed as being elitist. He also needs to be aware that poor wine lists and sky high prices have a bigger impact on restaurant wine sales than overwhelming choices. But I certainlyn widh him the best of luck. Italy and the wine world needs him. It will be interesting to see in what direction Mr. Galloni heads. How many wine critics have an MBA from MIT? Pretty impressive. That being said, I believe the role of the wine critic / reviewer has changed dramatically. In my opinion, the US is saturated with wine reviewers. All of these wine critics (WA, WS, WE, Suckling, Galloni, Tanzer) are making themselves obsolete, because they hand out so many 90 point scores. Also, the quality of wine that is going into the bottle is so good, that buying a wine based on a review is irrelevant. I don’t think most wine drinkers can tell the difference between a 89 point wine and a 94 point wine, but they can sure figure out the price difference. Wine merchants (K&L & JJ Buckley to name a few) provide detailed vintage reports for free. These reports are quite good, and I feel that wine drinkers are going to opt for a free report from their wine retailer than pay subscription fees. It is a safe bet, that these retailers are going to produce more of these vintage reports (2010 Bordeaux, 2006 Brunello di Montalcino etc etc) in the future. I assume that James Suckling and Robert Parker headed to Asia because they see a better opportunity to find paying subscribers in Asia than in the US. Even though the US is currently the largest market for wine consumption, James Suckling and Robert Parker know that if merchants are providing these detailed reports for free, then why would someone pay $100+ a year. As you know, some of these wine retailers have employees who have tasted thousands and thousands of the same wines, and have strong relationships with wine producers. These employees sound as good as Parker, Suckling and others. If Parker has 50,000 paying subscribers, he could probably grow his subscriber base by 5x (250,000) if he plays his cards right in Asia. Maybe more. Suckling can probably do the same, and at a subscription fee greater than $100 a year. Frankly, I was surprised that Parker only had 50,000 paying subscribers. Shows you how little I know. The other key point is that the wine retailers can talk about wines that they are selling, and have recently tasted. I can’t tell you how many times I have read a review from some of these publications, and then I find out that only 800 cases are for sale in the US, and you can’t find the wine. Or the reviewer tasted the wine 7 years ago when it was released, and has not provided an updated review. Well that doesn’t do me any good. Most importantly, in this day and age it is all about finding the best values, and the top wine retailers have no problem finding plenty of great wines, and offering them at great prices. This new generation of wine drinkers don’t really seem to value what wine critics have to say, and I don’t see them paying subscription fees, especially when a lot of information about wine can be found on the internet for free. It is far easier for them to find a $15 Malbec. These wine drinkers want instant gratification. They can walk into nearly any wine store or grocery store and find a Malbec that is lively and full of character. Pop and pour. Can’t say the same for a bottle of Bordeaux / California Cabernet.